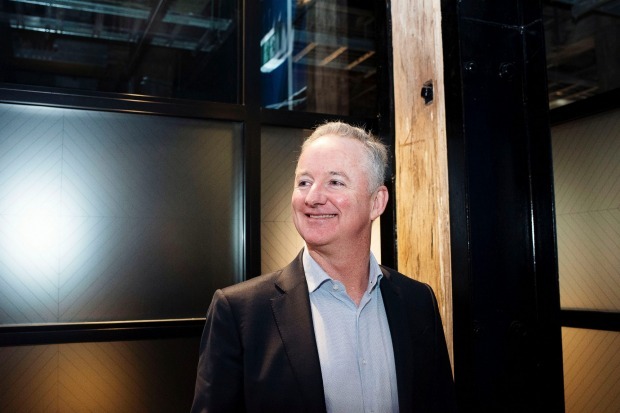 The $4 billion deal that will create Australia’s biggest media company began over a June breakfast at Jagos at Miller in North Sydney between two old colleagues, Nine Entertainment CEO Hugh Marks and Fairfax Media chairman Nick Falloon. Not far from the site that will likely house the combined Nine Entertainment and Fairfax Media, a new 39-storey tower at 1 Denison St, to be completed in 2020, Marks and Falloon talked shop and raised the idea of bringing two of Australia’s most famous media icons together. Nine and Fairfax have both faced their fair set of challenges in the evolving media landscape, but after years of righting the ships, what the pair of former colleagues spoke of had nothing to do with rationalisation. Marks and Falloon knew each other from the 1990s, working for Kerry Packer’s Publishing and Broadcast Limited. The Packers controlled Nine from the 1950s through to the late 2000s, when James Packer exited the business. Fairfax CEO Greg Hywood and Nine CEO Hugh Marks at Willoughby announcing the merger in July. Falloon had served as CFO then CEO of PBL and met Marks when he returned from Hong Kong, working as a lawyer for General Electric, and joined Nine as legal counsel in 1995, before making the switch to the network’s director of films and television, which he led for seven years before leaving the business. Marks also had a brief stint at Fairfax in the 2000s after the publisher bought independent TV production group Southern Star, which it later sold. Having got their own houses in order, Nine and Fairfax weren’t looking for bulking up for bulk’s sake. Any potential deal had to have a clear path to growth, particularly in digital. Marks, now Nine CEO, and Falloon, Fairfax chairman, spoke about the industry logic behind combining Nine and Fairfax and how the assets from each player could compliment, supercharge growth and provide scale. Both Fairfax and Nine had been exploring opportunities across the media market; in outdoor advertising, radio and television. But, Marks and Falloon agreed a combination of their two companies wouldn’t be a bolt-on, it would be transformational. The changing landscape will see two of Australia’s most historic media companies become one. The morning meal would kick off an ambitious plans, known as Project Wolfgang for Nine and Project Galaxy for Fairfax, which is set to change the Australian media landscape, assuming approval from the Federal Court on Tuesday. Media is a gossipy industry – nobody loves talking about media as much as media – and Nine and Fairfax were determined to keep the deal under wraps. That meant small teams and a short time frame. Marks would bring together his core team of head of strategy and corporate development Alexi Baker, legal counsel and company secretary Rachel Launders, chairman Peter Costello and chief financial officer Greg Barnes following a holiday in Hawaii. Nine CEO Hugh Marks will lead the combined group. Marks brought in former UBS and Credit Suisse banker Michael Stock, who’d worked with Nine during its previous discussions with Fairfax as well as TPG Capital when it ran the ruler over the publisher, now running Jefferies. Legal advice came from Ashurst’s Bruce Macdonald and Mark Stanbridge. Fairfax was ready to hit the ground running. The storied 177-year publisher’s executive team had been running a marathon for the past 18 months. Fairfax’s core team was chief executive Greg Hywood, head of strategy and corporate development Dhruv Gupta, general counsel and company secretary Gail Hambly and chief financial officer David Housego, along with Falloon. Fairfax would rely on long-time advisors Macquarie Capital’s Darren Keogh and Michael Milne, as well as King & Wood Mallesons including Tim Bednall and Shannon Henrick. Fairfax CEO Greg Hywood is leaving the business he started at in 1976. Marks and Baker had been doing a lot of work in the background in the lead-up to the Nine boss sitting down with Falloon. At the top of the list was getting their heads around the value of digital real estate classifieds and services Domain, which Fairfax had spun-off at the end of 2017, keeping 60 per cent and giving the remain 40 per cent to its shareholders. Drawing on No.2 players across the world, particularly Britain, Nine believed, despite short-term cyclical downturn, the long-term for Domain was strong. 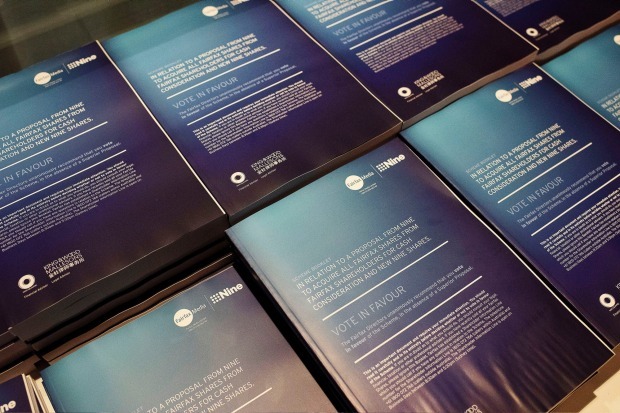 Additionally, after strong growth with the help of marketing from Fairfax’s famous mastheads, The Sydney Morning Herald, The Age and The Australian Financial Review, Nine believed its TV, digital assets and nationwide reach could turbocharge Domain in the future. A deal with Fairfax would also give Nine full ownership of subscription video on-demand service Stan, which could explore other partnerships in the future and the broadcaster already knew the business well as a 50 per cent shareholder. 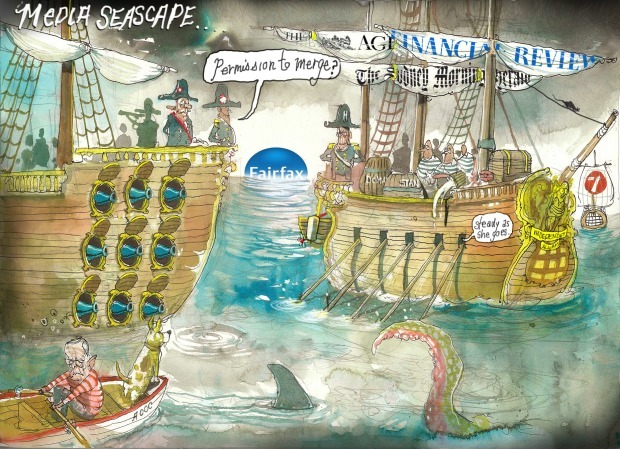 81.5 per cent of Fairfax shareholder votes cast were in favour of the merger. An underrated part of a potential deal was the publishing combination, which, increasingly weighted to digital, would have $500 million in revenue. For Fairfax the combination with a free-to-air network was long on the mind of the executive team. Fairfax had fought long and hard for the removal of media ownership legislation that finally passed through Parliament in 2017. In 2014, Hywood hired Gary O’Neill – a former chief of staff to Labor opposition leader Kim Beazley and long-time Packer lobbyist – to push for the removal of the ‘two out of three’ rule, which made sure TV, newspapers and radio couldn’t come together in one business. Fairfax and Nine held various discussions in late 2016 and early 2017, entertaining some form of transaction, although a merger wasn’t possible given media ownership restrictions at the time and talks cooled. The logic of Nine and Fairfax working together was sound. But Nine was in a turnaround phase and believed its share price was underperforming relative to where the board and executive team thought it should be and wanted to focus on getting its business humming before it looked to make a deal. Then as Fairfax was preparing to spin-off part of Domain, it became a takeover target for private equity firms TPG Capital and Hellman & Friedman. Fairfax’s preference was always for industry consolidation, but with media laws not changed yet, the non-binding offers on the table were too good for the Fairfax board not to grant the pair of buyout firms access to a dataroom. Ultimately both walked away. With Nine not wanting to talk following the long-awaited change to media laws in September 2017, Fairfax jumped over the road to Seven West Media, who until this month was based in Pyrmont. 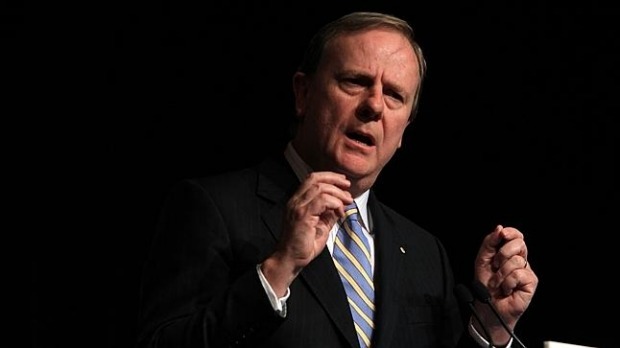 Nine Entertainment chairman Peter Costello wants Facebook and Google to be treated as publishers. Fairfax and the Stokes-controlled broadcaster had on-and-off conversations about how they could work out a deal. Bringing the two companies together had merits and would give Fairfax a stronger publishing footprint in Western Australia. In a Fairfax-Seven deal, the publisher would be the aggressor and likely control the combined group. 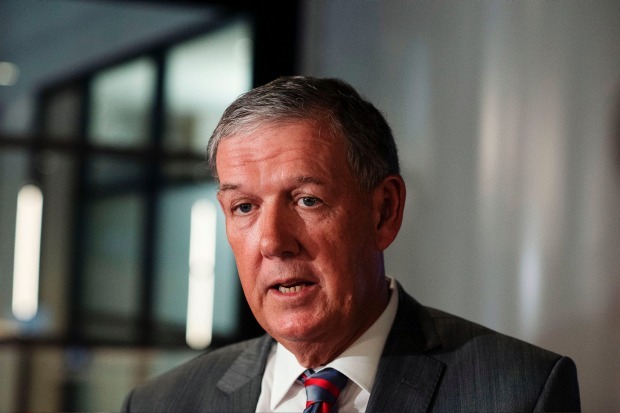 There were a number of talks with both Kerry and Ryan Stokes, although the discussions remained largely at the shareholder level. Seven Group, of which Ryan Stokes is CEO, owns just under 40 per cent of Seven West. Speculation of a Fairfax-Seven tie-up provided the perfect cover, internally and externally, for close-knit teams from Nine and Fairfax to make a deal happen. Nine’s hot share price run hard and many believed it should take advantage of its stock surging 80.7 per cent to $2.52 in the 12 months leading up to the announcement of the merger with Fairfax on Thursday July 26, 2018. A year earlier, Nine would not have been able to pull this deal off in the way it did. Marks and his team achieved a re-rating for Nine, including a November 2017 earnings upgrade, a rarity in media stocks in recent times, thanks to a strong start to the 2017-18 financial year with Australian Ninja Warrior and The Block buoying ratings, and investors confidence growing in catch-up and live streaming service 9Now. Nine chairman and former Liberal treasurer Costello made the official call to Falloon, and while it was a second offer that ultimately got the deal over the line, it kicked off a rapid diligence period of a little over three weeks, an unprecedented time frame for such a massive transaction. Fairfax chairman Nick Falloon will be deputy chair of the new company. Fairfax and Nine worked in overdrive into all hours of the night, including plenty of money spent having UberEats delivered to Pyrmont and Willoughby respectively, but the close-knit teams after years of drilling were well-oiled machines. The biggest surprise was it happened so smoothly and it never leaked to the media. The diligence process was hyper-focused. The executive teams had discussed industry logic before, had made their own assessments of each other’s businesses before coming in and knew exactly what they were looking for when they went over each other’s documents, and knew they could work together thanks to the Stan partnership. There were extensive management presentations going into frank detail about the “old media” assets of TV and print as well as the high-growth digital portfolios. In one of the final management meetings, Domain chief financial officer Rob Doyle was brought into the tent to be peppered with questions by Nine’s management about the business’ future. Nine were also particularly impressed with the job Chris Janz had done with Fairfax’s metro publishing business and the approach of forming specialist vertically integrated sales teams based on industry, instead of sitting and waiting for media agency money to come in. Nine wanted to do a largely scrip deal so it was vitally important Fairfax believed in the broadcaster’s future as well as what the two companies could become if they merged. Fairfax had a question mark over free-to-air TV’s future, but became comfortable around the future with Nine’s growing broadcast video on-demand strategy mitigating stress on revenue. There have been plenty of critics of the coming together of Nine and Fairfax, including Murdoch whisperer Terry McCrann who labelled the deal as two dinosaurs fighting extinction, ironically while News Corp is cutting costs in the same way Fairfax began in 2011, but executives on both sides believe much of the noise misses the point of the combination. The merger was never about preservation. By 2022, the combined Nine-Fairfax is forecasting 50 per cent of its revenue and 60 per cent of earnings before interest, tax, depreciation and amortisation to come from digital assets, a massive change to the composition to the way each earn money now. The diligence period came and went in a flash, but both parties had confirmed their existing beliefs the deal would form a stronger company, not just for shareholders, but for journalists and content creators. Crossing T’s and I’s on Wednesday July 25, the Nine and Fairfax boards met in the early evening for final approval before Launders and Hambly exchanged documents. Caught up in the pace of the merger, Launders cancelled her 50th birthday celebrations, although her husband showed up at Nine’s Willoughby bunker to have dinner with her and celebrate. When the deal was announced the next day Australia was shocked. Opinion was divided, especially among Fairfax’s own journalists who have been through a period of massive transformation over the past eight years. Tensions have calmed after repeated assurances Nine will maintain Fairfax’s editorial independence, is not looking to cut journalists or merge newsrooms and none of the $50 million in synergies will come from editorial. But, as the deal prepares to be finalised there is still fear of uncertainty. 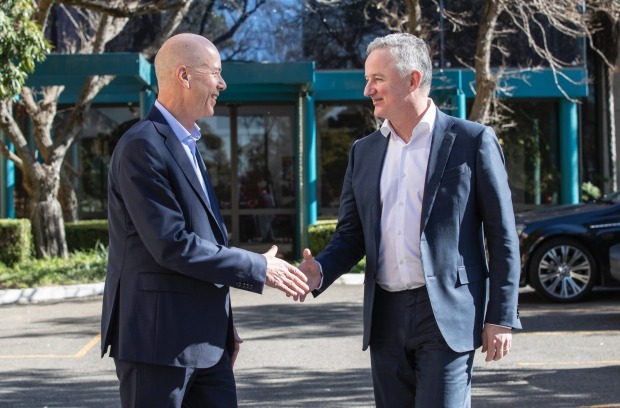 The announcement kicked off a wave of investor meetings for the Nine and Fairfax teams to sell the merger to shareholders. Hours of work has gone into selling the story to investors, integration work along with needing to run each of the businesses at the same time. The deal hit a small speed bump in October after Fairfax, Nine and Domain shares dropped heavily following a weaker-than-expected market update from the real estate classifieds business. But both companies reaffirmed their commitment to the deal. The share price drop would lead former Domain CEO Antony Catalano to move to stop the merger with an 11th-hour alternative deal to buy potentially 19.9 per cent of Fairfax and sell non-core assets the night before shareholders would vote on the deal. But the Fairfax board, after taking advice, knocked Catalano back stating it “did not constitute a superior proposal”. Catalano has flagged he will attempt to challenge the deal when it goes for final court approval on Tuesday, and while anything is possible, most believe the move is a long shot. When the time finally came for the vote on Monday, Fairfax shareholders overwhelmingly approved the deal; with 81.5 per cent of votes cast in favour. 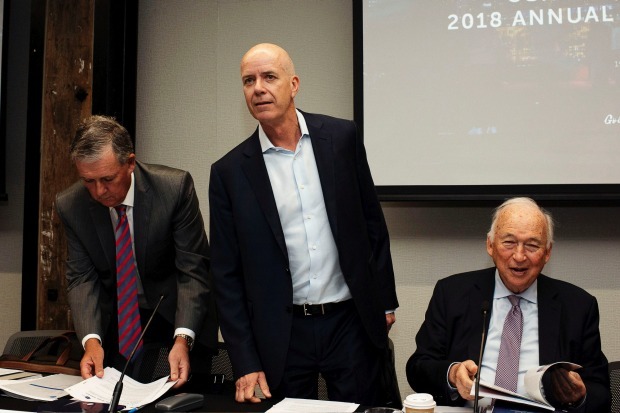 Marks, who will be CEO of the combined group, sat at the back of the meeting as his counterpart Hywood addressed Fairfax shareholders for the last time, saying goodbye to a company he started at as a cadet in 1976. It was an emotional moment for the usually stoic Hywood who, with his executive team, spent the past eight years making sure Fairfax and its journalism could not only survive, but thrive. When the meeting closed, Marks moved to the front and shook hands with the Fairfax board and Hywood, a passing of the baton, the end of an era, and the beginning of a new one. Could Peter Costello nurse Paul Keating’s superannuation baby?